For a detailed review on the THREE Flash Performance Eyeliner Pencils, please click here. From left to right: 01 Eye Love 02 Eye Believe 03 Eye Sense 04 Eye Belong. 01 Eye Love: A peachy-pink with a slight grey accent and silver flecks. 03 Eye Sense: A dark burgundy with pink and gold flecks. 04 Eye Belong: A blue iris (purplish-blue) with pink, silver and blue flecks. From left to right: 05 Eye Rock, 06 Eye Kon, 07 Eye Doll, 08 Eye On. 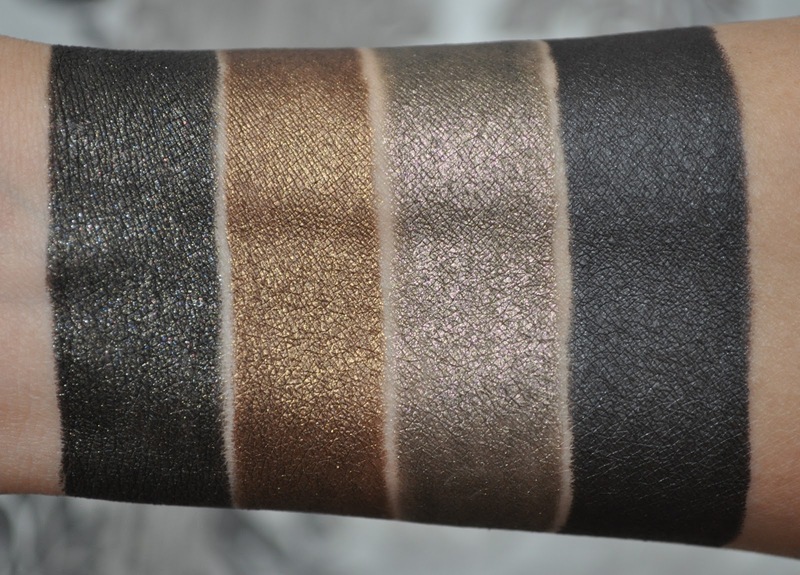 06 Eye Kon: an antiqued bronze with gold flecks and a khaki undertone. 08 Eye On: A Slate black with tiny blue, pink and silver flecks. 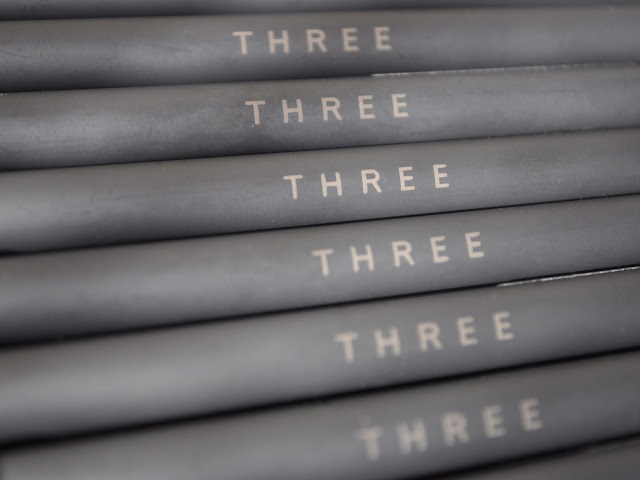 THREE Flash Performance Eyeliner Pencils retail for 3,150 yen ($39.48), and are exclusively sold in Japan. However, I know these liners can be purchased online at ichibankao.com (at a substantial markup). If you're in the Kanto region, The THREE beauty line can be found at the following counters located in Tokyo: Mitsukoshi (Ginza), Isetan (Shinjuku), Odakyu (Shinjuku), Seibu (ikedukuro), Seibu (shibuya), and Hikarie (Shibuya). Eye Kon is swoonworthy! So, so lovely. Thanks a lot for the pics!! That's very kind of you! But I can't ask you that...would you like anything from Spain?? You're fantastic! I'd love some of these, but like others, I don't relish the thought of paying the marked up prices on Ichibankao. Thank you for the swatches! I didn't realize that I would want to complain when a product is too beautiful. I don't know where to start; maybe with 03 Eye Sense or 04 Eye Belong; I should take stock of what eye pencils I currently have and see where the gaps are. These eye liners are a must in anyone's beauty arsenal! Wow these are so amazing! I can't afford them but I like to be able to see what these great products look like. So I am not sure if my wallet is blaming you for some severe bleeding.... lol! Have you try THREE's oil cleanser? Is it any good do you know? Wow Cutie Fishball, you've made my week!! If you ever want any JP products, just message me :) Also, I'd love to know yours thoughts on the THREE products you purchased! I have to say, there isn't one product I've tired that I haven't fallen head over heels for! I love the THREE skincare line! The cleansers are great! I am obsessed with eye liners, and am glad you've introduced me to these; they are so pigmented and unique. I am seriously sad that they're not available in the U.S. (or priced reasonably online). One way or another, I know I'll succumb! These eyeliners are amazing, and have become a cannot-live-without staple in my beauty routine. These look freakin' gorgeous!! Thanks for all the great swatches! So happy that I found your blog :-) via Kate (Drivel). You two are killing it...so amazing. Are you able to ship to the U.S. ? I'm dying to get 01, 05, and 07. Welcome aboard, and I hope you enjoy my blog. 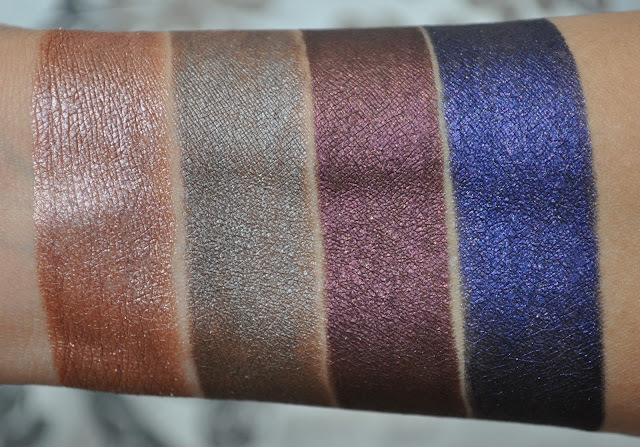 I am seriously lusting after these eyeliners ... especially Eye Kon and Eye Doll. Such pretty shades! Thanks for the thorough review. I wish these were available in the States. THREE will one day be available in the states. Dear Lizzy, very nice review. All the colors are gorgeous, I can't decide! I'm very disappointed that I saw it only now as I just came from Japan first week of April. I managed to only buy some of the skin care from THREE. Would like to know how much these are so from there I can decide how many I'll buy haha. What a shame! But, I do like THREE's skincare. Hope you're enjoying it, as well as your time in Japan. The liners retail for 3,240 yen. Hope this helps, and if you need any other information, please let me know. Promise to respond faster...sorry.